I know it’s been a while since I uploaded the last post! 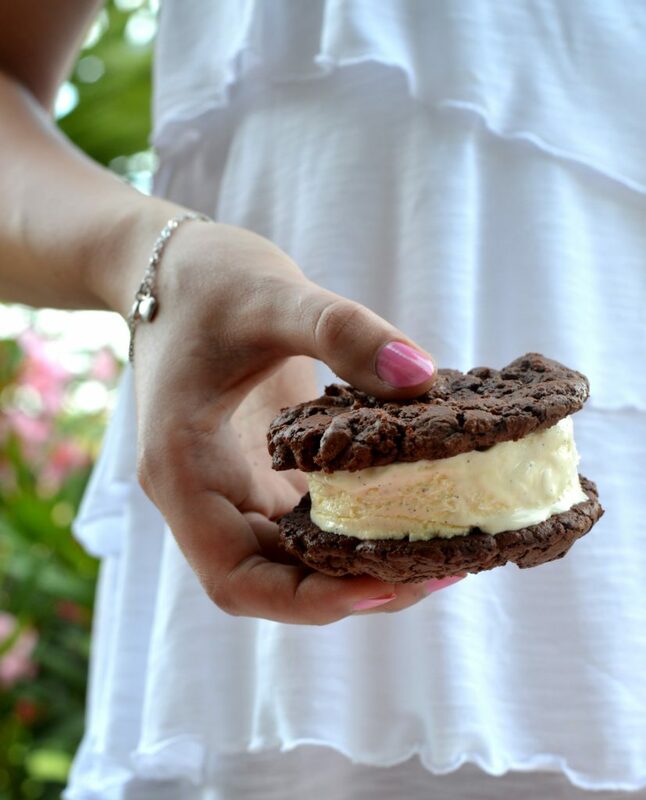 But today’s recipe was absolutely worth the wait: ice cream sandwiches! Today I finally reveal my secret recipe for my favourite dark chocolate chip cookies! These cookies are crispy on the outside and super chewy inside! And I never ever had a cookie with such a rich chocolate taste before! Everytime I baked these, they turn out perfectly! Best birthday present, dessert, sweet snack or small present ever, I promise! But today I show you more than just my favourite cookie recipe! Finally the summer has arrived in germany! Time for mild summer nights, barbecues and refreshing snacks like sorbets, semifreddos and of course ice cream!! 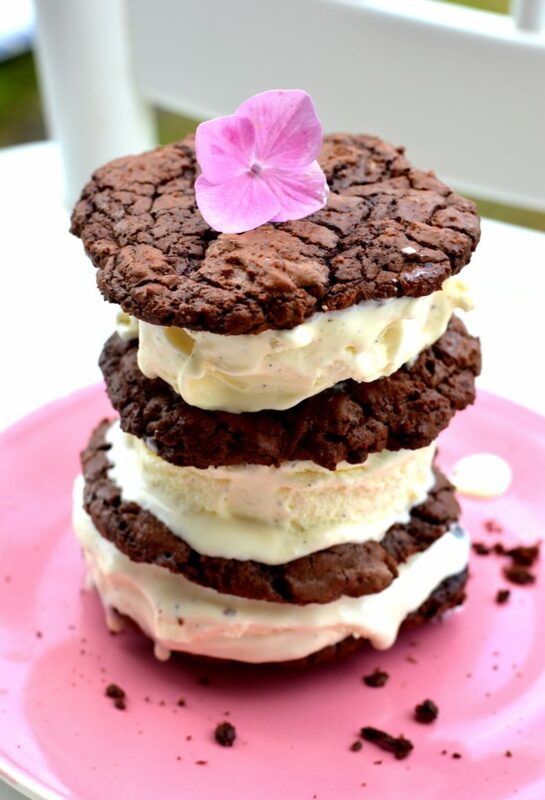 Imagine these chocolate cookies are filled with ice cream! And of course not ordinary plain ice cream… I am talking about homemade mascarpone vanilla ice cream! Very creamy texture with a rich vanilla taste! Chocolate and vanilla is just an all-time favourite combo! 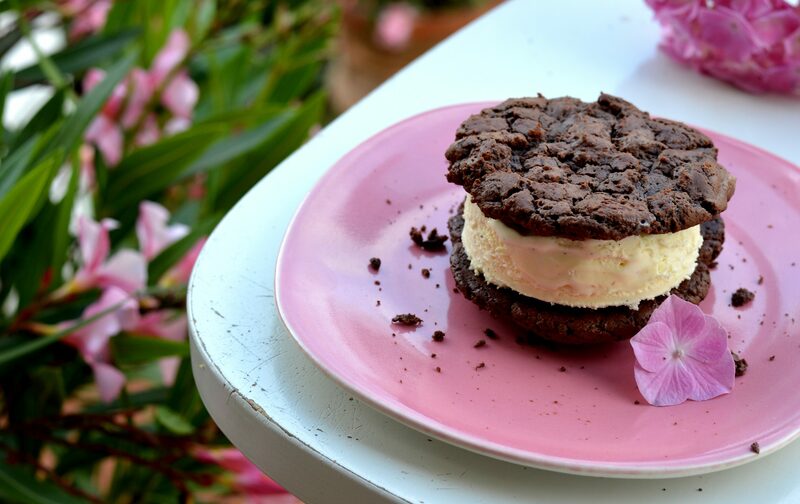 The crispy chocolate cookie with the taste of dark chocolate is the perfect complement to the sweet and creamy ice cream –> great combination of two intensive flavors! And by the way, these cookies turn out even better when you take your favourite chocolate for baking (I used my Ghirardelli storage!). Of course you can substitute the dark chocolate cookies also with normal chocolate chip cookies (my favroite recipe here). For the cookies: In a bowl whisk together flour, salt, nutmeg and baking powder. Melt butter and dark chocolate and let it cool. In another bowl mix sugar, vanilla extract and add the eggs one after another. Now add the melted ingredients to the butter-sugar mix and mix well together. With a wooden spoon add the dry ingredients and mix until just incorporated. Now add chocolate chips. Refrigerate dough for at least 2 hours (and up to 2 days). Preheat oven to 175°C and prepare baking sheets. Form small balls of dough and put them on prepared baking sheets. Bake the cookies for 12-14 minutes. After baking let them cool on the cookie sheets for 10 minutes (!) before moving them to a wire rack to let them cool completely. For the ice vanilla ice cream: Mix together the egg yolks with the heavy cream, then add pulp of vanilla bean and vanilla sugar (if you want a really vanilla taste, add vanilla extract as well). Add sugar and in the end the mascarpone. Put mixture into a ice cream maker and blend for 20-30 minutes, then freeze in completely in a large plastic box, try to just cover the bottom of the box (about 2 cm thick!). If you don't have an ice cream maker just pour mixture into a large plastic box and freeze in for at leat 5 hours. Take the ice cream and with a round shaped cookie cutter or a sharpe knife cut out round shapes. 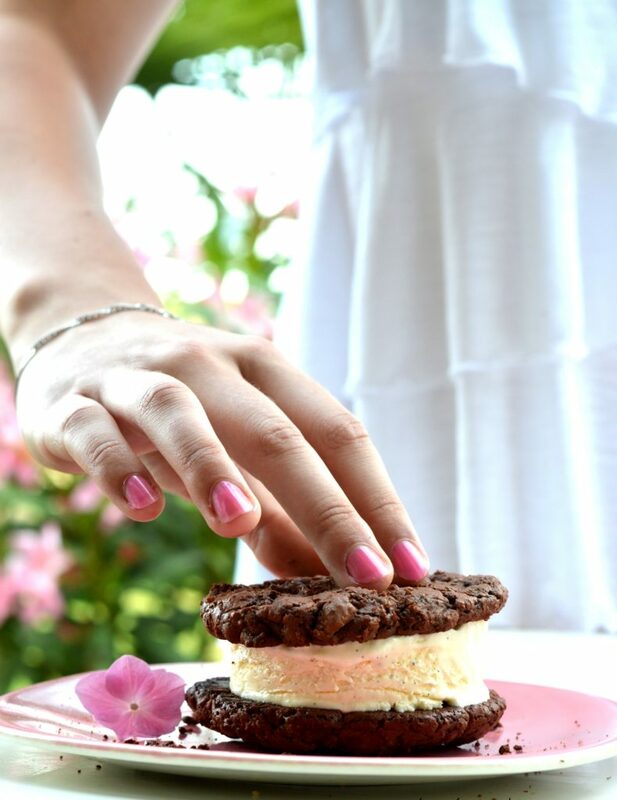 Place the piece ice cream on one cookie and top with another one (for a cookie tower just take less ice cream and bigger cookies! Enjoy with fresh fruit! Have fun baking and enjoy the summer!